Paul Vile, brother of Philadelphia psych-folk artist Kurt Vile, is the subject of a new documentary about his music scene hustle selling jello shots and t-shirts. 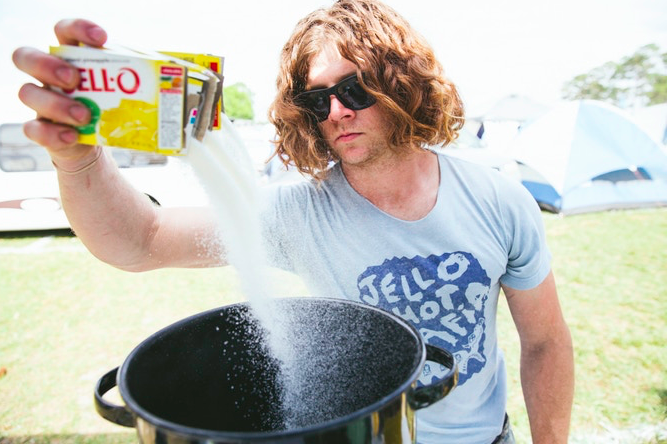 Frequent concertgoers in Philadelphia may be familiar with a man who looks a lot like Kurt Vile and sells homemade Jello shots at venues in the city and beyond. That would be Kurt Vile's brother, Paul, a stone mason by trade who has also made his mark as a hustler of Jello shots and t-shirts. How and why Paul Vile does this are the subjects of a documentary currently in progress by Out of Town Films co-founder Colin Kerrigan, who wants the world to know more about a local legend in Philadelphia. Kerrigan edits content VICE and Pitchfork put out, among other outlets, and recently launched a Kickstarter to help cover the post-production costs of a project entitled, "Jelloman, if u will." The campaign site for the project includes a video preview. "In 2016, I picked up a photo assignment for VICE following Jelloman around a music festival in Florida," Kerrigan wrote. "I photographed him as he carried out his jello antics throughout the festival grounds, where after only half an hour I saw him make over $300 selling his shots and shirts. I knew there was more to the story than just jello." Kerrigan started following Vile around with a camera to get a more complete picture of the man behind so many colorful, gelatinous creations. Funds from Kickstarter will go toward some editing help, legal assistance, publicity and film festival submissions. The project has already surpassed 30 percent of its $20,000 funding goal. You can make a donation here. "The greatest risk here is pretty simple: not being able to tell Paul’s story," Kerrigan wrote. "I’ve got a ton of really intimate, funny, and exciting footage to share, and would really like to deliver it to you all in the best package possible."